Wind Power Continues Steady Growth Across The U.S. : The Two-Way The wind power industry is celebrating a milestone in November: 70 gigawatts of generating capacity. Researchers say that's enough to power 19 million homes. Wind turbines stand in Western Maine along the Kibby Mountain range. The U.S. wind power industry is celebrating after reaching a new milestone in November: 70 gigawatts (GW) of generating capacity. "That's enough to power about 19 million homes," says Michael Goggin, senior director of research at the American Wind Energy Association (AWEA). There are more than 50,000 wind turbines operating across 40 states and Puerto Rico, according to the AWEA. 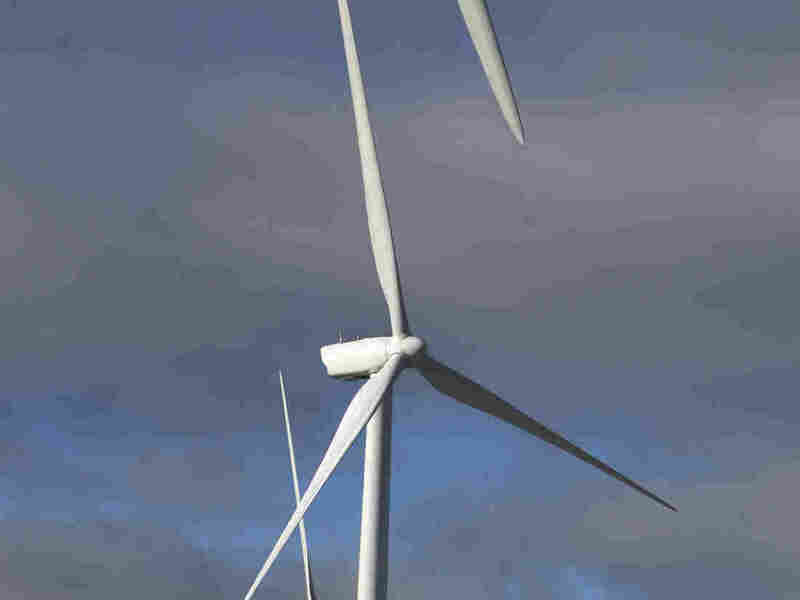 Wind power has grown quickly in recent years. It sprinted past the 50 GW and 60 GW milestones in 2012. Growth temporarily stalled as members of Congress let a federal tax credit expire. But now the boom times are back. The federal budget deal, passed by Congress and signed by President Obama last week, includes a five-year extension of the Renewable Energy Production Tax Credit. That sent solar and wind company stocks soaring. As a low-carbon source of electricity, wind power also got a boost from the Paris climate change agreement and the Obama administration's Clean Power Plan. There's plenty of room to grow, too. The bulk of the nation's electricity still comes from traditional fuels: coal, natural gas and nuclear. Wind accounts for just a fraction of total generation. "We're approaching 4.5 to 5 percent of total electricity use in the United States," says Goggin. In 2007 — just eight years ago — that figure was less than 1 percent. One reason wind is becoming more competitive is price. "The cost of wind energy is down by 66 percent — or two-thirds — since 2009," says Goggin, who credits new technology and economies of scale as the industry gets bigger. Goggin says the wind industry is on-track to meet a plan laid out by the U.S. Department of Energy to generate a fifth of the country's electricity by 2030.